Zang Zhen is a professor of pre-Qin history and doctoral supervisor from the School of History and Civilization at Shaanxi Normal University. Born in 1943 in Chengdu, Sichuan Province, he started his undergraduate study in the department of history at Peking University. From 1970 to 1980, he taught in rural middle schools of northern Shaanxi Province and was later admitted to Nanjing University to study pre-Qin history under the historian Liu Yuhuang. After obtaining his master’s degree, he started teaching at Shaanxi Normal University. He wrote more than 10 essays about ancient jade culture that were later collected into the book A Study and Critique on Ancient Chinese History, as well as Chinese Ancient Jade Culture, co-authored by Pan Shouyong. According to relevant archaeological data, more than 5,000 years ago, large-scale cultural exchanges took place in ancient China. Prior to the Silk Road, the trade of jade mined in the Kunlun Mountains of Northwest China facilitated communication between the Western Regions and Central Plains. The nephrite jade from the Hetian region north of the Kunlun Mountains was transported constantly to the Central Plains, where there was an urgent demand for jade, thus forming the famous “Jade Route.” How did jade become an early medium of exchange that helped blaze this route of civilization stretching across large parts of China? Why were ancient people particularly partial to Kunlun jade? A CSST reporter recently interviewed Professor Zang Zhen to learn about the jade culture in ancient China. CSST: Could you talk about the value of jade in the pre-Qin period? Zang Zhen: It is said in The Lost History of Yue kingdom that jade was treasured as a weapon in the time of the legendary Chinese ruler—the Yellow Emperor. In fact, our ancestors from the pre-Qin period traveled a long distance to discover, mine, transport and carve jade not merely to make weapons or for just decoration. In their minds, jade had a mysterious quality beyond its value for daily use. The aesthetic value of jade is an auxiliary function that became prominent in later generations. As is mentioned in the Shan Hai Jing (Book of Mountain and Sea), the white jade from the Mi Mountains, Shaanxi Province was a sacrificial food for worshipping the heaven and earth spirit and could be worn to protect men from ill omens and sinister forces. An abundance of literature shows evidence of jade’s use as a sacrificial food for deities and ancestors in such Chinese classics as Shan Hai Jing (Book of Mountain and Sea), Book of Odes and the Chinese poet Qu Yuan from the Kingdom of Chu’s Sorrow after Departure, Asking Heaven and Nine Apologies. Many believe that the ancient people manufactured the jade artifacts to show their wealth and status. In fact, living in a society dominated by ancestor worship where supernatural concepts played a prominent role, people valued jade objects not necessarily as indicators of social status. Ultimately, they aspired to vanquish the evil forces that haunted them. As the Chinese saying goes, the major affairs of a state lie in worship and military events. Before offering sacrifices to the ancestors, enough food, which took the form of jade, should be fully prepared so as to secure the blessings of the ancestors. Before praying for the divine protection of the deities of heaven, earth, mountains and rivers, jade was usually buried in an altar or anchored in the running streams. After a chieftain passed away, jade pieces needed to be buried together with him. A gentleman must wear jade pieces in order to ward off evil spirits. In short, it was the desire to survive that inspired ancient people to produce all kinds of jade artifacts. From the middle and late Neolithic Age, or the “Jade Age” as some scholars call it, and the Bronze Age to the early Iron Age—in other words, from the mytho-historical Three Sovereigns and Five Emperors times, to the Xia, Shang and Zhou dynasties, and to the Qin and Han dynasties, there was a splendid ancient jade culture that lasted for thousands of years. CSST: What makes the jade mine from the Kunlun Mountains stand out? Zang Zhen: The name of jade in mineralogy is tremolite. Modern European scholars call it “soft jade” to distinguish it from the emerald, or diopside jadeite, the latter of which is harder and did not become popular until the Ming and Qing dynasties. In fact, the hardness of so-called soft jade is no less than a steel knife, and the dense fibrous crystal phase structure makes it the toughest the best among all kinds of rocks. It was determined to be the optimum material for making weapons and tools. At the same time, the jade showed the luster of translucent warmness and moisture after being polished, which made it look like suet, chicken oil, litchi and steamed chestnut. Because of its appearance, people easily associated it with food. That was how the understanding of jade as a food for the deities came into being and what made jade outstanding among all minerals. Jade of varied quality can also be found in Xiyugou Town, Xiuyan County, Liaoning Province; Dushan County, Nanyang city, Henan Province, and Wenchuan city, Sichuan Province. However, the jade mineral veins are small and scattered in these places, with low output and poor texture, which are far inferior to Kunlun jade. The Sayan Mountains beside the western side of the Lake Baikal, Russia, and the Yushan Mountains of Taiwan are also home to jade mining bases, but their relationship with ancient Chinese jade culture has not yet been made clear. So is there no other optimum jade mine across the vast expanse of the Central Plains of China? The answer, shown by the geological and mineral resources, is no. CSST: How was the Jade Route discovered and known in the pre-Qin period? Zang Zhen: The earliest jade culture formed and thrived as part of Hongshan Culture, a Neolithic culture in the upper reaches of the Liao River, Northeast China, during the thousand-year gap from 5,000 to 6,000 years ago. The raw materials of the Hongshan Culture jade mostly came from Xiuyan County, Liaoning Province. About 5,000 years ago, the Hongshan Culture declined, and a jade culture with the explicitly imprint of the Hongshan Culture mark appeared in Lingjiatan Village, Hanshan County, Anhui Province. A few years later, Liangzhu Culture, the last Neolithic jade culture, emerged in South Jiangsu Province and North Zhejiang Province about 4,200 to 5,200 years ago. The ancient jade culture entered its prime during the thousand gap years in Southeast China, with its sphere of influence centered on Liangzhu and reaching as far north as Liaodong Peninsula, as far south as Guangdong Province and as far west as Hubei Province. So where did all these jade materials come from? In the 1970s and 1980s, some scholars speculated that the jade materials could only be obtained nearby due to the limited range of primitive activities. However, the archaeological achievements of jade culture changed such notions. The jade figurines unearthed in Lingjiatan have almost the same gestures as those from Hongshan Culture. The jade phoenix from Shijiahe Town, Hubei Province is almost cast in the same mould as that from Longshan Town, Shandong Province, while the jade cong [a cylinder with a circular inner section and squarish outer section] from Shixia Village, Guangdong Province and one from Liangzhu Town, Zhejiang Province were possibly carved from the same piece of jade material. It was really amazing that as early as 4,000 to 5,000 years ago, people had already conducted such a wide range of cultural exchanges and had the exceptional ability to travel across thousands of miles. Based on the things I just mentioned, we could solve the mystery of how the jade materials arrived at the Liangzhu site, where jade mines are nonexistent. The archaeological data shows that traces of Liangzhu culture and people who traveled to exploit jade can be found in North Jiangsu Province, South Shandong Province and even Xiuyan County of Liaoning Province. Therefore, it can be deduced that from as far as Xiuyan County via Bohai Strait, North Jiangsu Province, to Liangzhu of North Zhejiang, there existed the early “Jade Route” in the East coastal China. When the jade resource in Xiuyan had been drained, our forefathers turned their eyes westward to the Min Mountains, a main southern range of the Kunlun Mountains, and the Qilian Mountains, the range of which is a northern prolongation of the Kunlun Mountains. As years went on, our forefathers inexorably targeted the Kunlun Mountains for jade, which is why the refined jade from Kunkun Mountains was continuously transported eastward. CSST: Please talk about how the “Jade Route” impacted the ancient cultural exchange between Western Regions and Central Plains. 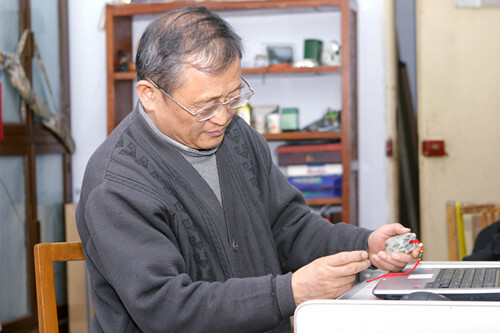 Zang Zhen: The research on jade culture has largely broadened people’s horizons. From the Yellow Emperor era on, the opening of the western “Jade Route” made the Inner Mongolia steppe and Hexi Corridor in Gansu Province the route of strong vitality as the main artery that fostered the east-west Chinese cultural interaction. That transportation of Kunlun jade eastward perpetuated the jade culture created in Hongshan and Liangzhu, and merged it with the subsequent bronze culture in a few years. As the food offered to the deities and spirits in the ancient sorcery, jade, which embodies pure elements and symbolizes the true, the good and the beautiful, represents people’s desire for harmony with the gods and in interpersonal relationships. From the perspective of morality and social etiquette, it also molded the basic lifestyle of the Chinese nation—a nation of rites and propriety. Jade craftsmanship was unfamiliar to ancient Egyptian and Greek people despite the fact that Europe is rich in jade mines. They instead made the sculptures of the gods from marble and created the brilliant Western civilization. Therefore, the the “Jade Age” is unique to early Chinese civilization, giving it a distinctive brilliance shining from within.